A wildlife group has been receiving daily calls from people reporting marauding crustaceans in Berlin's Tiergarten. The invasive species are often seen scuttling outside the Spanish Embassy. Parts of Berlin have been overrun with scuttling red crayfish that are likely trying to expand their territory, a German conservation network announced on Thursday. The invasive red swamp crawfish have been spotted scuttling around the paths of the Tiergarten park and even parading outside the neighboring Spanish Embassy. The red critters are often spotted in the park, but they have been appearing in much larger numbers this year, picking up considerable attention on social media. The Nature and Biodiversity Conservation Union (NABU) said it has received large numbers of sighting reports in the past weeks. It said the increased numbers are problematic for the ecosystem of Berlin. The Tiergarten population of the non-native crayfish likely took hold from people dumping them in the ponds there. They are a popular addition to aquariums given their striking appearance and their hardy nature. Measurements by the fisheries office revealed that the water quality of Tiergarten was quite high, meaning the crayfish were probably migrating due to population expansion. Who let the fox out? If you suddenly come face-to-face with a fox after a night out clubbing in Berlin, don't worry - you're not hallucinating. The entire city of Berlin has become a habitat for foxes, says conservationist and wild animal consultant Katrin Koch. In fact, studies show that there are now more fox dens in the city than in forests. It's not just foxes that might cross your path unexpectedly. Racoons are all over Berlin as well. They like to climb houses and play around in gardens and parks, and can even be found next to busy streets. Racoons are troglobionts, which means they live in caves. And they actually find more caves in the city than in the countryside, be that in roofs, chimneys or hollow trees. As if the thought of wild foxes and raccoons in the middle of Berlin isn't scary enough, you could also easily run into a wild boar. They usually live on the outskirts of the city, but lately they've been coming more frequently toward the center, says Koch. The good news is that they've never attacked anyone, and don't really pose a threat. Nor do foxes or raccoons, by the way. Although beavers aren't native to Berlin, in the last decade they've made the city their home. That's because the species is protected, and they are not allowed to be hunted anymore. Now, almost all Havel and Spree waters are populated by beavers - so watch out for the furry, bucktoothed animals when you take a nice summer dip on one of Berlin's many waterways. Gotham might be the home of Batman, but Berlin is a city of bats. One of their favorite hangouts is the citadel in Berlin's Spandau district, where thousands occupy a huge wintering ground. But they can also be seen swooping all over the city center, as buildings act as artificial cliffs for them. Whether it's a hot summer day or a snowy winter night, if you look closely you'll see the cutest Berliners of all: bunnies! Rabbits love hanging out in the city's parks, like Kleistpark, but they can also suddenly scamper out of any bush. I once encountered a fox surrounded by a family of rabbits in the middle of Berlin and thought: Am I in Wonderland? Maybe I need to party a bit less. The biggest sensation of Berlin's wild animals is also one of its rarest: the white-tailed eagle. According to Koch, the first white-tailed eagle returned to Berlin in 2002 after nearly a century. It's the largest raptor, or predatory bird, that Berlin has to offer. So next time you see a large brown bird with a wide wingspan and a sharp yellow beak making the rounds over Berlin, snap a pic. The most famous falcon in Berlin is the kestrel. They love breeding high above us, where there's fresh air - and space, such as wall openings and window bays. Kestrels are now protected by the Nature and Biodiversity Conservation Union (NABU), which installed nesting boxes all over the city at schools, churches and industrial buildings - making them apartment dwellers just like most Berliners. Berlin is the city with the largest number of birds in all of Germany, including songbirds, raptors, and even large seagulls. But the cutest of them all is the cheeky Berlin sparrow that'll happily eat out of your hand. While the sparrow population in other German cities like Hamburg is decreasing, they're thriving in Berlin and are ready to dip their beaks into your food when you're not watching. One of Berlin's most unique wild animals is the night owl, or party animal. Its habitat includes the districts of Neukölln, Friedrichshain and Kreuzberg. This species can be identified by their glitter-covered bodies, preference for drinking Club Mate and their attraction to loud electronic beats. In the early morning hours, the party animal can also be found sleeping on the city's trains. The North American species often squeeze out local populations of crayfish and carry diseases. They were labeled as an invasive species of high importance by the European Commission last year. NABU, Germany's largest nature conservation group, called on aquarium owners to refrain from releasing exotic animals into Berlin's water systems. Under poaching laws, it is forbidden to catch and grill the tasty crustaceans. The German capital has been suffering from a plague of rapidly reproducing invasive crayfish. Now, health authorities have given the all-clear for a simple solution to reduce their numbers: Eating them. 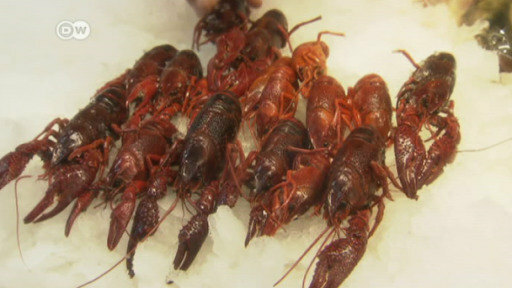 A plague of Louisiana crayfish is affecting the streams and the lakes of the German capital. Biologists think the little critters were abandoned as pets, and since then their numbers have exploded. The latest attempt to control them involves capturing, cooking and crunching. What happens if you give decorator crabs access to fluffy pom-poms? The animals will look like Christmas. But there is method to their seasonal attire.